Meet the everyday citizens who went to work on September 11, 2001, and unwittingly became a part of history. Watch CNN Presents "Footnotes of 9/11" on Sunday, September 11 at 9:00 p.m. ET. (CNN) -- For Tim Duffy, the day started with a postcard-perfect sky over Cape Cod. Within hours, everything changed. From his jet fighter, Duffy had a ghastly bird's-eye view of lower Manhattan, watching the second tower of the World Trade Center collapse beneath him. "Anytime I see it's a beautiful day to fly, I kind of think of that morning," recalls Duffy, who was a lieutenant colonel in the Massachusetts Air National Guard at the time. Duffy not only witnessed the most horrific day in modern U.S. history -- his story is one of the numerous footnotes in The 9/11 Commission Report. Aided by more than 200,000 FBI interviews, the report is the official accounting of September 11, 2001. It's an exhaustive examination of what happened leading up to and during that day when Muslim extremist hijackers commandeered four planes and flew them into New York's World Trade Center Towers, the Pentagon in Washington, and a field in western Pennsylvania. But buried at the back of the nearly 600-page report are 1,742 footnotes -- many of them stories of people who, like Duffy, came face-to-face with the horrors of 9/11. Those footnotes illustrate how ordinary Americans responded that day. "I always thought the most interesting part of the whole report was in the footnotes," said John Raidt, one of the primary 9/11 commission report investigators who now works as a senior fellow at the Atlantic Council. "What struck me, particularly ... was a sense of responsibility," he said. "There was so much guilt shared by so many people that had nothing to feel guilty about. "Ironically, at the time I think that feeling wasn't shared so deeply -- and I want to be fair -- as you go up the rungs." CNN spoke to eight of the men listed in the commission report's footnotes -- the ticket agents, the pilot on alert to shoot down a passenger jet, the maintenance worker who took a phone call from a flight attendant on one of the ill-fated jets. These people woke up on 9/11 expecting a routine day. Ten years later, the guilt over being unable to avert the disaster still looms for some. As he looked at the clear blue sky over Cape Cod on the morning of September 11, 2001, Lt. Col. Tim Duffy felt frustrated. Duffy -- who was stationed at Otis Air Base but worked as a civilian pilot for United Airlines -- had flown the day before, so it was unlikely he'd get to go up in the skies on such a beautiful day. 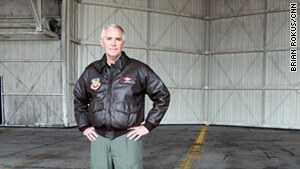 Col. Tim Duffy may have gotten the toughest order on 9/11: be ready to shoot down a passenger plane. Then, he got the call that would change his life forever. He learned that American Airlines Flight 11 had possibly been hijacked. Duffy and his wingman raced to the two jets that were "hot" --meaning armed with missiles. He flew at supersonic speed toward New York City, figuring at his altitude he wouldn't break any windows -- and this was a national emergency. But before he got there, he received a call that a plane had hit the World Trade Center. And then another. Then, he reached the skies over Manhattan and couldn't believe what he was seeing. "As I am looking at the square, it just started getting smaller,'' Duffy said. "I had no frame of reference for it ... and then as I am looking at it I see a plume coming out of the bottom and I realized it was falling away from me as I was looking at it." What Duffy witnessed was the north tower and the beginning, he realized, of a war already under way. "That was the only time during the day I was absolutely horrified," he said. Three commission investigators interviewed by CNN said Duffy personified courage under fire. He was told by superiors he might have to shoot down the next plane -- a plane that could have been carrying his United colleagues. Soon into his flight to New York, Duffy was asked whether he would be able to pull the trigger on a passenger plane, if necessary. "That kind of ticked me off, that's why it sticks in my memory, that call," he says. "After a 20-something-year career being [put] in that position. "If I wasn't ready to do whatever was called for, I was the wrong person and that's it." The three investigators said when they interviewed Duffy, the only time he showed emotion in recounting his actions that day was about that issue -- still upset that anyone would question his ability to answer the call of duty, first and foremost. Chicago dispatcher Ed Ballinger still blames himself for the deaths of the passengers and crew on United Airlines Flight 93. Ballinger was United Airlines flight dispatcher for 16 flights that day, including Flight 93. It was supposed to be his day off. 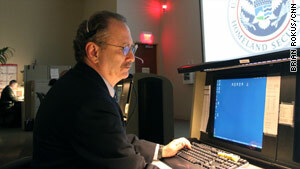 Ed Ballinger, a retired dispatcher, still worries about whether he adequately warned Flight 93 about cockpit intrusion. After learning of the terror attacks in New York, Ballinger frantically typed out messages to pilots -- at least 122 in an hour --trying to warn the planes that one plane, possibly two, had hit the World Trade Center towers. It is the message and response from Flight 93 that continues to haunt him. "I thought of the most succinct [warning] message ... with the least amount of words," Ballinger said. "'Beware cockpit intrusion.'" Flight 93 pilot Jason Dahl replied in a written message, "Ed confirm." In the four minutes it took for Ballinger to send the initial message and reply to Dahl's message, the hijackers had taken control of the plane. The commission report would later confirm that the passengers, already aware of the other hijacking outcomes, rushed the cockpit and the hijackers --sending the plane into a dive. Flight 93 crashed into a field near Shanksville, Pennsylvania, killing all aboard but likely saving others in the nation's capital where investigators believe the plane was headed. Ballinger went into his own tailspin. He tried to return to work but realized the safest place for a plane was on the ground and he looked for reasons to keep them grounded. He took time off, and later was deemed unable to resume work. 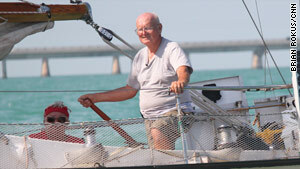 He retreated to a local warehouse for six months where he mourned and refurbished an old sailboat. He applied for and received disability and retired from a 44-year aviation career. He has been sailing with his wife ever since, admittedly still haunted by whether he should have said something more explicit in his warnings. Investigator Raidt said Ballinger was proactive that day and acted without being told by a supervisor what to do. "Circumstances were beyond his control and that's why it's heartbreaking that he feels such a sense of responsibility," Raidt said. Mike Tuohey, a retired US Airways ticket agent, "lives a life of avoidance" in his rural Maine home, steering clear of news about the wars overseas and any other aftermath of 9/11. Still, months after his retirement, Tuohey said he started coming unhinged, having hallucinations and visions of the hijackers driving by in cars. Retired ticket agent Mike Tuohey pegged two hijackers as "Arab terrorists," then chided himself for the assumption. Tuohey is footnote No. 1 in the 9/11 Commission Report, holding the unenviable historical note of being the first to encounter the ringleader of the 19 hijackers, Mohammed Atta, and fellow hijacker Abdul Aziz al Omari on the morning of September 11, 2001. Investigators believe the hijackers split up to avoid detection. Ten of them convened at Boston's Logan Airport to board American Airlines Flight 11 and United Airlines Flight 175, the two planes they would use to strike the World Trade Center towers. Atta chose Portland, Maine, a small airport that's just a short plane ride to Logan Airport. Atta and al Omari showed up at the US Airways counter where Tuohey worked at the time to check in for their flight to Boston. "I'm looking at the two of them and I said [to myself] 'If this guy doesn't look like an Arab terrorist, nobody does,'" Tuohey said. Tuohey kicked himself for thinking such thoughts, resolving that the two could just be Arab businessmen. Nonetheless, Tuohey gave them a rough time -- a fact the investigators confirmed. With no legal reason to hold them off the plane, he checked them in. Hours later, when he learned two planes had hit the World Trade Center, he said he instantly knew the two men he had checked in were responsible. Tuohey took a few days off, but later returned to work and eventually retired. About five years ago, Tuohey -- in his first on-camera interview -- told CNN that reading the 9/11 Commission Report lifted a burden off of him. He said he reasoned that if so many intelligence agencies had information that such a plot could conceivably happen, how did they expect "a little ticket agent from Portland, Maine," to stop the hijackers when he knew none of the intelligence that had been gathered? All of those interviewed by CNN said they can remember 9/11 like yesterday; that it is a part of their lives that will always be there. For some, the pain is still there. Others, like air traffic controller Terry Biggio, who was in charge of Boston's air traffic center that morning, have tried to make the world safer. Biggio followed Mike McCormick -- manager of the New York air traffic center on 9/11 -- to Iraq to help rebuild that nation's civil aviation system after the U.S.-led invasion and war. On the morning of 9/11, Biggio ordered the hijackers' tape recordings be pulled and reviewed after a controller reported hearing something suspicious. That move gave officials the first proof that multiple planes were hijacked. Biggio believes the role he played on 9/11 -- getting other planes safely landed -- is why God put him on this earth. 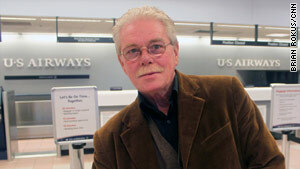 Former ticket agent Vaughn Allex spent months feeling guilty after checking in two hijackers. Former American Airlines ticket agent Vaughn Allex -- who checked in two of the five hijackers who crashed Flight 77 into the Pentagon -- now provides logistical support for federal air marshals who patrol the skies. He spent months wallowing in guilt but, like Tuohey, Allex had no legal right to prevent the two he checked in from getting on the plane. And, as the investigators pointed out, three other hijackers were already on Flight 77, anyway. Allex knows he did not suffer the terrible losses of so many families and hopes his work supporting air marshals will help prevent another 9/11. But he said that day did take one precious thing from him: the joy of a clear blue sky. "When I go out on a beautiful day, I look up and I go, 'That sky is September 11 blue,'" Allex says. "I've never been able to look at the sky and not said 'September 11 blue' because that's the way it was that day." Those charged with investigating the 9/11 attacks have struggled, as well, having to listen over and over to the horrific tapes of the doomed passengers and the voices of the hijackers, and interview people who were rescued from the stricken buildings. That was one of the hardest parts for investigator John Azzarello, an attorney, who thought long and hard before working for the commission. Two of his brothers-in-law died in the World Trade Center attacks. His wife supported Azzarello's decision -- but she did not want to hear the daily details during the 18-month investigation. When the report was delivered, she decided to attend the hearing even though Azzarello warned her that it would include the transcript of Flight 77's communications -- the plane that was responsible for her brothers' deaths. There was so much guilt shared by so many people that had nothing to feel guilty about. "I do remember during that hearing, when we were collectively reading our report as a team, that there were some gasps from the audience of horror reactions, some crying," he said. "And one in particular I recognized was my wife's reaction." Despite the heartache, Azzarello has no regrets. He believes his work could prevent other families like his from going through the same pain. Investigators said the 19 hijackers -- despite intelligence information that had accumulated in several government agencies over time -- managed to still slip through the cracks in the system. By the time they got to the airports, the die had been cast, John Farmer said. Farmer, now a Rutgers law school dean, was in charge of the commission's team that determined who did what and when on 9/11. "The time to have stopped these attacks was before they ever got on the airplane, before they ever got into the country," Farmer said. "Once they were on those airplanes, they couldn't be stopped." CNN's Max Newfield contributed to this report.